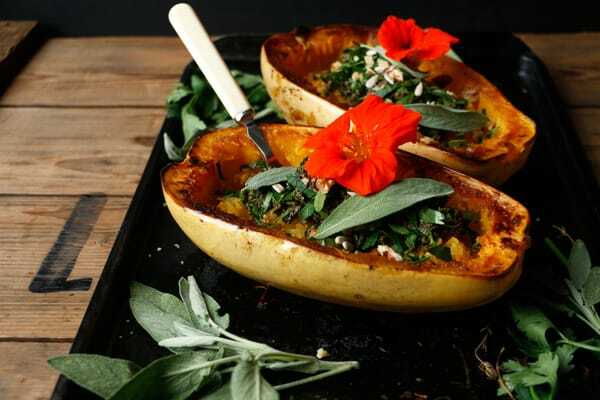 Last year at this time I’ve made Roasted Spaghetti Squash with Plums and Cashew Sauce which was a sweet dish and this year I’m going more classic – Roasted Spaghetti Squash with Walnut Sage Pesto. It’s a simple delicious and comforting recipe you could easily make for weeknight dinner. Sage is one of the herbs that I really love, but somehow don’t use very often and if you like me hopefully you welcome the reminder. 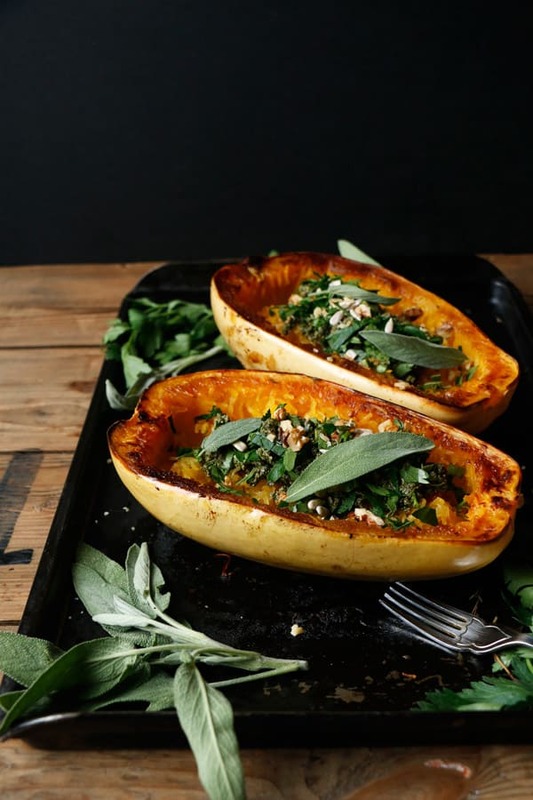 I love everything about this recipe, the buttery tasting squash, sage, walnuts, sunflower seeds and fresh parsley. There’s texture, creaminess and flavour. 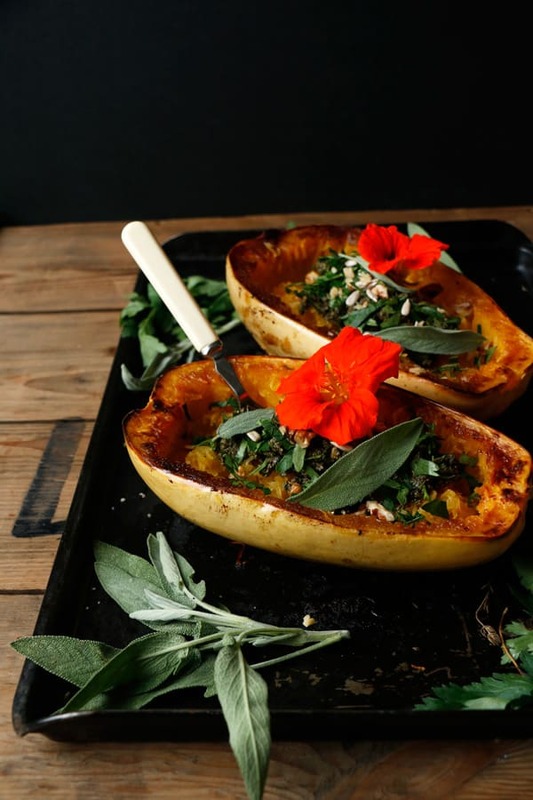 I have purposefully overdone the squash, because I love the caramelised flavour, it was a very large squash and it took only about 40 minutes. It would have been done in 30 minutes for a lighter more stringy texture. Do roast it just as you like it. This pesto recipe is a bit more nutty, if you like the pesto to be more vibrant green you will have to add extra parsley. You can toast the walnuts and sunflower seeds first before making the pesto, I’ve made it both ways and I think it tastes lovely either way. The second time I’ve added some nutritional yeast which added extra depth to the pesto. I recommend trying it with and without to see which one you prefer. Carefully trim spaghetti squash on each end and cut into half. Scrape out the seeds with a spoon. Rub the edges with a little olive oil, sprinkle with sea salt and place cut size down onto a baking sheet. Place thyme sprigs underneath and bake for 30-40 minutes until the flesh is soft when pierced with a fork. While the squash is roasting prepare the pesto. Place the sage, parsley, walnuts, sunflower seeds, garlic, sea salt and pepper into a food processor and pulse few times until coarsely ground. Add lemon zest, juice and olive oil and blend until incorporated. Taste for seasoning. Add nutritional yeast for more cheesy flavour. Once the spaghetti squash is soft, take a fork and gently pull the inside of the squash to create spaghetti like strands. 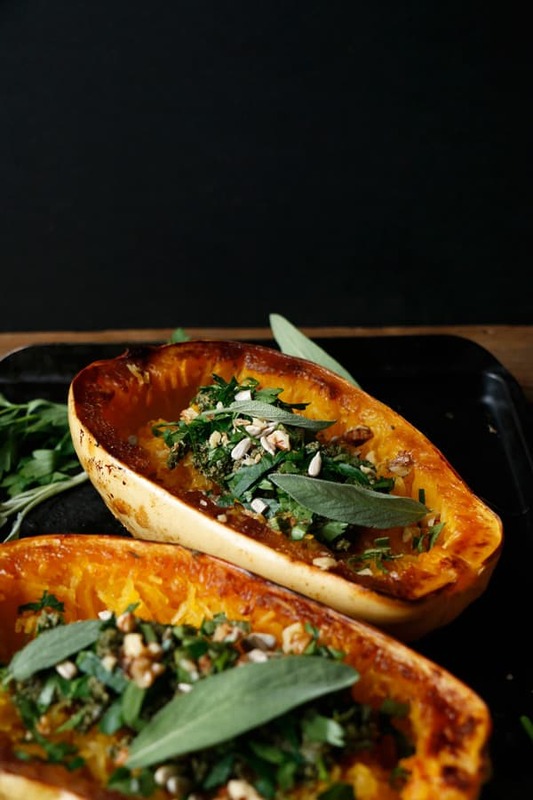 If you like to serve this dish inside the squash like me, dollop generous amount of pesto on top, sprinkle with chopped walnuts, sunflower seeds and fresh parsley. 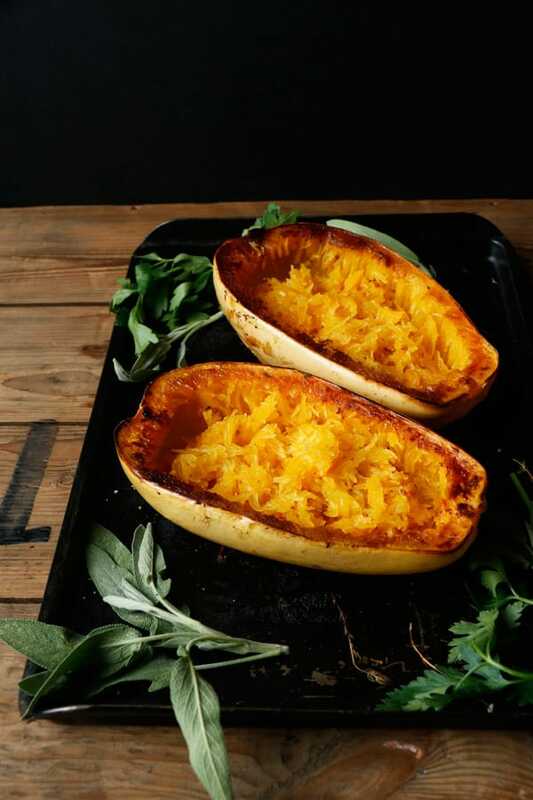 Spaghetti squash doesn't take very long to roast. 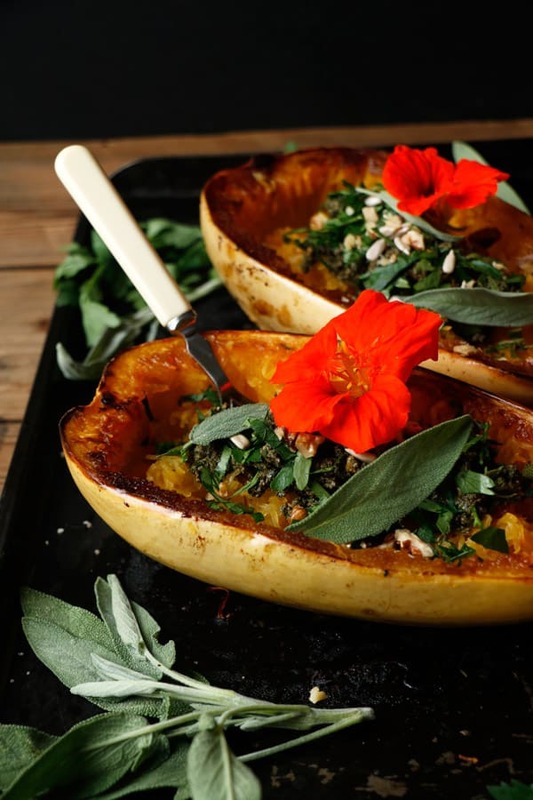 I have purposefully overdone the squash, because I love the caramelised flavour, it was a very large squash and it took only about 40 minutes. It would have been done in 30 minutes for a lighter more stringy texture. Do roast it just as you like it. If you have extra time you can toast the walnuts (about 5 minutes) and sunflower seeds (about 2 minutes) until fragrant and slightly toasted before adding into the pesto.